Are you setting realistic goals for first-to-second-year retention? 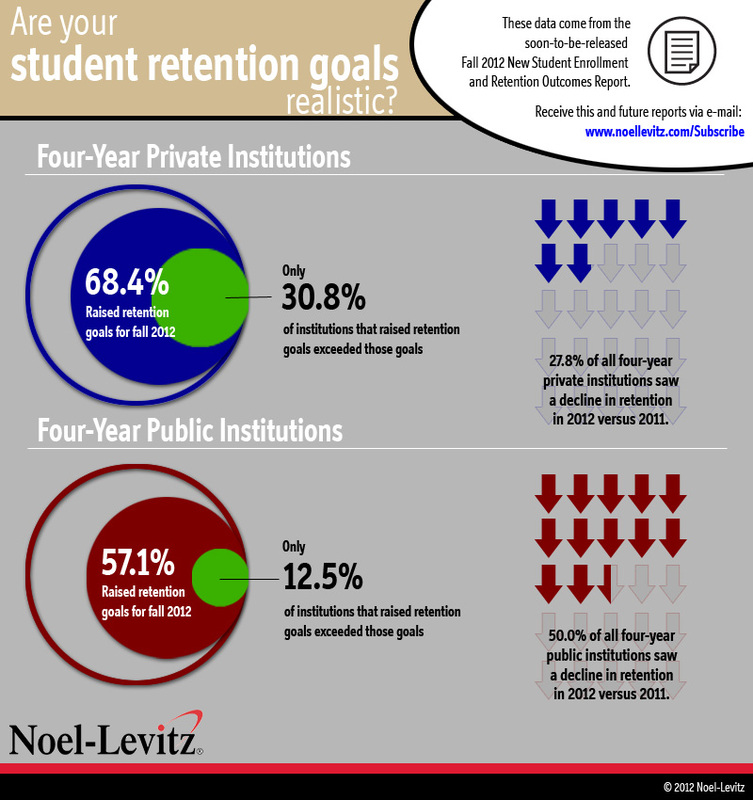 New data from Noel-Levitz’s soon-to-be-released Fall 2012 New Student Enrollment and Retention Outcomes Report show that although many four-year institutions continue to raise the bar on their retention efforts, very few of these institutions are managing to exceed their goals. In particular, as shown in the illustration above, more than half of both public and private four-year institutions that participated in the study reported raising their 2012 goal for first-to-second-year retention from its 2011 level. But, of those institutions that raised their goals, just 30.8 percent of four-year private institutions and 12.5 percent of four-year public institutions managed to exceed their new goal. While it seems that many institutions are more aggressively working to improve student retention and success each year, the majority of four-year institutions are struggling to meet the demand of their higher goals. Noel-Levitz’s 2012 National Satisfaction and Priorities Report is a useful resource for campuses hoping to strengthen student success initiatives. The report, released earlier this year, details national student satisfaction levels and associated priorities for college students. Is your institution looking for opportunities to improve student retention efforts? Send us an e-mail to discuss your specific campus challenges with one of our consultants. Note: The above graphic was updated on December 11, 2012 to reflect a correction in the data. We had previously reported that 23.3 percent of four-year private and 39.5 percent of four-year public institutions reported a decline in retention rates, but the actual rates were 27.8 percent and 50 percent at private and public institutions, respectively, as shown above.